A bomb explodes in the middle of a peaceful rally of radical demonstrators in Chicago. At least one of the radicals goes on the run. The year is 1886. A bomb goes off in a Greenwich Village townhouse, killing three members of the militant Weather Underground. Afraid of being arrested, several of their comrades go on the run. The year is 1970. In his life and in his writing, 26-year-old playwright Zayd Dohrn is a connection between these two powerful moments in American political history. Dohrn, a graduate of Boston University’s playwriting program, captures the former in “Haymarket,” his drama now getting a workshop production at the Boston Playwrights’ Theatre. The latter comes from his own life: Dohrn’s parents, Bernardine Dohrn and Bill Ayers, were two of the Weathermen who fled. While there are similarities between the incidents, Dohrn insists he’s not drawing on his parents’ experience to tell the tale of two married radicals from a century before. Much as Arthur Miller did in “The Crucible,” his play about the Salem witchcraft trials inspired by the anticommunist witchhunts of the 1950s, Dohrn looked to the past to comment on the present. His chief question was this: How does a city respond when its residents are scared and vulnerable? Obviously 9/11 and terrorism were on his mind. But in doing research, the Haymarket bombing came up. The explosion happened when a group of anarchists assembled in Haymarket Square began to disperse. Shots were fired, killing 11 people, including seven policemen. Albert Parsons went into hiding but eventually emerged. Several anarchists were hung. It’s generally accepted that none were responsible for the bomb. Hiding in plain sight Bill Ayers and Bernardine Dohrn were among the most telegenic figures of the ’60s radical movement. After the accidental explosion in the townhouse in 1970, Ayers and Dohrn went into hiding. They were put on the FBI’s “Ten Most Wanted” list. Seven years later, their first son was born and joined their life underground. They named him Zayd, after murdered Black Panther Zayd Shakur. When his brother Malik, named after Malcolm X, came along, their parents turned themselves in. The charges against Ayers were dropped. Dohrn was given probation for a misdemeanor, but later served a year for refusing to cooperate with a grand jury. The family moved to Chicago when Ayers got a teaching job at the University of Illinois at Chicago. The playwright remembers his late-’80s teenage years in a home filled with activists and academics having intense discussions about Nicaragua and nuclear proliferation over tofu and sauteed spinach. Today the radicals are reformers: Ayers, a full professor, writes about early childhood education, Dohrn heads a program for juvenile justice at Northwestern University. Melding past and present After graduating from Brown University with honors in 1999, Zayd Dohrn went to Hollywood to try his hand at screenwriting. After a disillusioning few months, he enrolled in Boston University’s playwriting program. 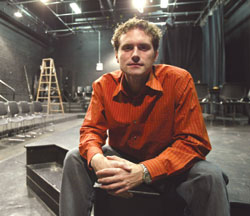 His first professional play, a dark comedy called “Shameless,” was produced last year at the Actors’ Workshop downtown. Earlier this year, he finished the first draft of “Haymarket” but didn’t know what to make of it. Kate Snodgrass, director of the BU program, brought actors in to read it. “It was incredibly helpful and I rewrote a ton,” he says. Snodgrass asked if Boston Playwrights’ Theatre could do another reading. The decision to produce the play there came swiftly afterward. Dohrn has a fairly clear vision for his life now, too — one that melds his past and present. “I don’t want to be a political writer,” he says, adding that he can see himself writing a romantic comedy or an action film. “I think it can get old to feel like you have to address some topical issue with everything you write.